Yamaha quad raptor 350 yfm r 05-13. 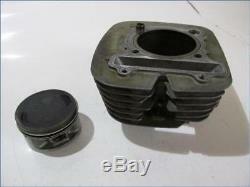 Piston cylinder good condition - some light scratches p2b0g01102 yamrapmot01 15360. Our parts are pre-packed in our warehouses, so it is impossible to take measurements on parts for possible adaptations. Our parts are checked for disassembly in our workshops and before shipment. If you have any doubt about compatibility with your vehicle, please contact us with your. Brand / model / cm3 / year / serial number. The item "piston cylinder yamaha quad raptor 350 yfm r 05-13" is on sale since Saturday, October 27, 2018. It is in the category "auto, motorcycle parts, accessories \ motorcycle parts \ other". The seller is "provencemoto" and is located in France. This item can be delivered anywhere in the world.